Well, after several months of writing, revising and a change (slightly) in direction - my thesis proposal defence arrived. June 21 was the big day. At the University of Manitoba, proposal defences are public affairs - just to add to the stress. My defence was attended by about 10 people - the associate dean (chair), advisor and committee, another faculty member (an acquaintance) and several good friends from my PhD cohort. I have to admit that I was so nervous, I thought I was going to be sick - but I got through the presentation, then the questions, after which everyone was asked to leave the room while the committee deliberated. After several anxious moments chatting in the hall with friends, we were called in. To my relief, the Associate Dean announced that I had passed both the oral and written proposal with no changes needed - just a few points to clarify on the ethics application and eventual dissertation. Whew! Now, I can get my ethics applications together - I have to apply at two instituttons, U of Manitoba and Brandon U, where I work. I have since then completed these - and they are in the process of being submitted. The entire process to get here has been long, a lot of work and at times stressful. After my initial submission, I met with my advisor and one committee member back in January, who gave me input - I made some revisions and submitted again - this time to the entire committee. Again, I received suggestions and comments - as I worked on changes, reflected on the input and on some other events that had occurred, and discussed ideas with colleagues, I decided to change the direction of the research a bit - in one way it would be more convenient, and would also allow for deeper & richer data collection. Finally in May I submitted the new version. I met with my entire committee. At the time, it felt like I was way of track and my thought at the meeting was that I would have to restart - yet, committee members left the meeting commenting on how good the meeting was and that the proposal was - with a few changes - ready to defend. Reflecting as I made the long drive home, I realized that these scholars were pushing me to think - to expand my views, to consider new things. Over the next few weeks, I took the advice given - I went into Winnipeg and had great conversations with individual committee members. These really helped to clarify what I needed to do. I completed these final revisions, wrote up an abstract and sent it all in. The defence came and here I am. Ethics applications are ready to go, and once approved I can get started on the research. A bit of advice for others taking this journey. First, you have to be patient, it is a long process. Take the time, don't set unrealistic deadlines - I had to revise mine a few times - it is a powerful learning process. Something I did that helped a lot was talking with colleagues and cohort friends. Such support and input was vital, if you are going to do this, a learning network is very important. I was able to bounce ideas off of others, talk out issues I had, discuss theories and get input into writing. One thing I would do differently, though, is to include my advisor and committee in the process more than I did. I tried to do the work with little input from my advisor & committee as I went, not wanting to bother them, trying to prove that I can do it. When I finally took the time to meet and talk with them, I found they were truly there to help - to stretch my thinking, to help me grow as a scholar and researcher. So - lesson learned - as I proceed with the research and dissertation writing - I will meet and converse with these people more as I go. 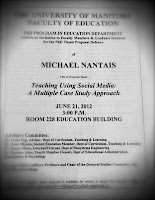 Oh yea - my thesis title is Teaching Using Social Media: A Multiple Case Study Approach. 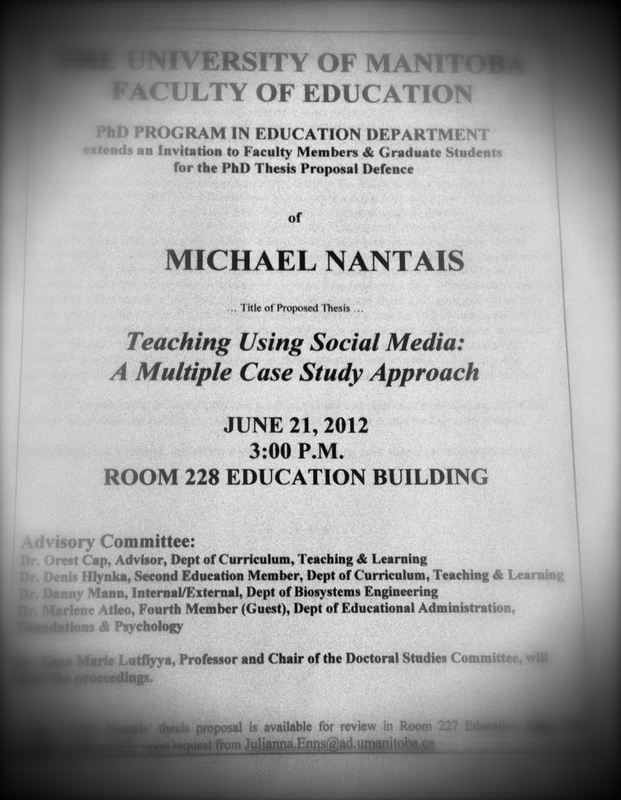 I plan to examine teachers' perspectives as they use social media in their practice - how? why? barriers, supports needed, does using SM have an affect on their practice? etc. As a few of my committee put it - I want to tell their stories. Should be fun! Congrats Mr. Nantais! It sounds like a stressful process, I don't know if I could do it. Will your thesis be public once it is completely finished? It would be interesting to read your work. Thanks, Kirsten. Yes - I plan to use a creative commons license for it - hopefully this will all be wrapped up in about a year's time. Thanks for stopping by! Hey Mike. Congratulations on the proposal completion! If you are going to be in Winnipeg during the summer, let me know. Perhaps a coffee/tea? Thanks, Gary. Won't be back to the city, heading overseas for much of it. Will have to try at some other point. Ok. All the best across the pond! Sometimes you have to look forward to the journey proposal of defence that what things and the ideas would actually suit to it.